This is a unique book with nearly 1000 problems and 50 case studies on open-ended problems in every key topic in chemical engineering that helps to better prepare chemical engineers for the future. The term "open-ended problem" basically describes an approach to the solution of a problem and/or situation for which there is not a unique solution. 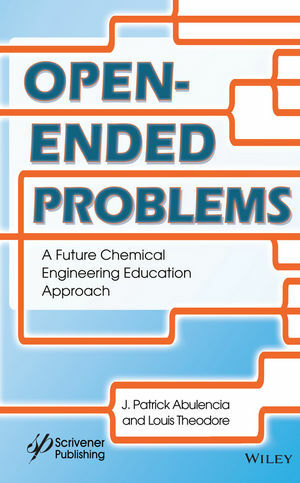 The Introduction to the general subject of open-ended problems is followed by 22 chapters, each of which addresses a traditional chemical engineering or chemical engineering-related topic. Each of these chapters contain a brief overview of the subject matter of concern, e.g., thermodynamics, which is followed by sample open-ended problems that have been solved (by the authors) employing one of the many possible approaches to the solutions. This is then followed by approximately 40-45 open-ended problems with no solutions (although many of the authors’ solutions are available for those who adopt the book for classroom or training purposes). A reference section is included with the chapter’s contents. Term projects, comprised of 12 additional chapter topics, complement the presentation. This book provides academic, industrial, and research personnel with the material that covers the principles and applications of open-ended chemical engineering problems in a thorough and clear manner. Upon completion of the text, the reader should have acquired not only a working knowledge of the principles of chemical engineering, but also (and more importantly) experience in solving open-ended problems. What many educators have learned is that the applications and implications of open-ended problems are not only changing professions, but also are moving so fast that many have not yet grasped their tremendous impact. The book drives home that the open-ended approach will revolutionize the way chemical engineers will need to operate in the future. LOUIS THEODORE, EngScD, is a retired professor of chemical engineering (50 years). He is the author of several Wiley publications, including Fluid Flow for the Practicing Chemical Engineer, Thermodynamics for the Practicing Engineer, Mass Transfer Operations for the Practicing Engineer, and Air Pollution Control Equipment Calculations. Dr. Theodore is also a contributor to Perry's Chemical Engineer's Handbook. J. Patrick Abulencia is an Associate Professor in the Department of Chemical Engineering at Manhattan College. He received his B.S. degree in Chemical Engineering from Manhattan College, and his Ph.D. in Chemical and Biomolecular Engineering from Johns Hopkins University. Dr. Abulencia typically teaches material and energy balances, thermodynamics, fluid flow, and unit operations laboratory. His research interests include water filtration, life cycle assessment, and engineering education. He co-authored with Louis Theodore Fluid Flow for the Practicing Chemical Engineer.